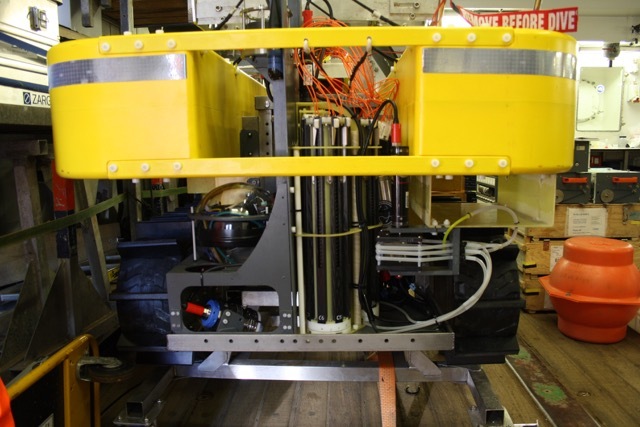 A multi-optode-profiler carrying 18 O2 optodes separated in 3 revolver magazines allowing a successive use of the sensors during the deployment was successfully tested at the Arctic deep sea seafloor (RV Polarstern expedition PS 99.2). The new sensor system is mounted on a mobile autonomous crawler TRAMPER (AWI; HGF Alliance ROBEX) allowing to perform repetitive oxygen profiles with a maximum resolution of 100µm and a length of up to 25 cm. Eighteen Piccolo2 OEM oxygen modules (PyroScience, Germany) installed in a pressure housing are used for life time-based optical determination of oxygen. Using a multiplexer-board they are connected to a logger module. 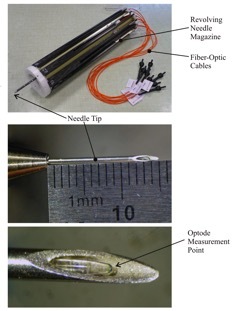 Bare fibre oxygen sensors (OSB430; PyroScience, Germany) are connected to these modules and are housed in 6mm pushrods ending in 0,9mm syringe needles serving as a protection for the fibers while being inserted into the sediment. 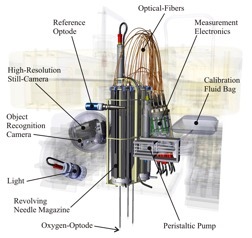 A novel in situ calibration-system that provides recurrent zero-point calibrations in situ throughout the deployment is added to validate the stability of the sensor signal and to ensure long-term accuracy. Oxygen is a key molecule in earth ecology and global element cycle. Produced by photosynthesis, oxygen is the ultimate electron acceptor for organic mater mineralization and thus directly connected to the carbon cycle. A lot of our knowledge on oxygen exchange and carbon mineralization at the vast ocean floor originates from high-resolution studies of oxygen distributions and fluxes at the sediment water interface and in the top layer of marine sediments. These studies allow to determine the amount of organic material that escapes mineralization and is retained in the sediment record - with strongest implications for O2 and CO2 levels in the global ocean and, ultimately, the atmosphere. Despite the fact that several studies demonstrated strong spatial and temporal heterogeneities of oxygen distributions and fluxes at the seafloor, our understanding is still based on relatively few “snapshot” measurements. Long-term investigations, covering the entire seasonal cycle, are rare, especially in the deep sea.